Richard Michaelson is a retired Foreign Services operative. In the thirty-plus years he worked in that capacity, Michaelson traveled all around the world on various missions for the State Department, sometimes as an attached member of an embassy or consulate and sometimes just as an observer or consultant. To hear Michaelson discuss the assignments he has dealt with, they were largely of a very routine and mundane nature. To hear others talk about some of them, they were anything but routine and mundane, often very hair-raising and dangerous to life and limb. Speaking of limb, Michaelson is missing the tip of his left pinkie as a result of one such “routine” task. He explains in one novel that he lost it when he mistakenly got in the way of some flying metal. When pressed hard on the subject, he admitted finally that the metal was a bullet and when pressed even more, that the bullet was fired from an AK-47 by rebels who were very unhappy with him. Such is Michaelson’s manner of explaining his experiences. Michaelson has explained on a couple of occasions that the State Department learned very early in the existence of the CIA that the Agency did not agree with the separation of roles quite like State saw them and therefore there was a huge amount of distrust of the intelligence that State got from the CIA and vice versa. Therefore, one of the major roles that Michaelson filled was to keep an eye on the same things as the Agency boys were watching so when the CIA reports came in, a different viewpoint was already available. Over the years, Michaelson has acquired a good relationship with many agents from the various Intelligence departments as well as the odd enemy here and there. As the five-book series opens, Michaelson is in his mid 60’s and has retired a few years before. He is not ready to disappear completely, however, and has his sites set on a more prestigious posting in the current Administration. This ambition is played up quite a few times in each of the books as a method to denigrate his actions by those who feel threatened by them. In one adventure, he is asked by a member of the White House to look into a matter of some importance but to do so on the quiet. While thus employed, he is faced with stonewalling people who, to protect their own turfs or hides, do not want him to find out what they know and use his celebrated ambition as a reason to dismiss what he seeks. Dismissing Michaelson is never a good idea, however. He is a very quiet, sedate, self-deprecating man who is not the least bit embarrassed about his desires but he is also not in the least intimidated by the powerful or the posturing. Once he gets his teeth into a job, or a mystery, he does not let go. He does not yell or threaten or demand or beg. He does not have to. He has been around long enough to know that if one way does not work, there are usually two or three other approaches that might and while time can sometimes be a hindrance, it can also be used to his advantage. 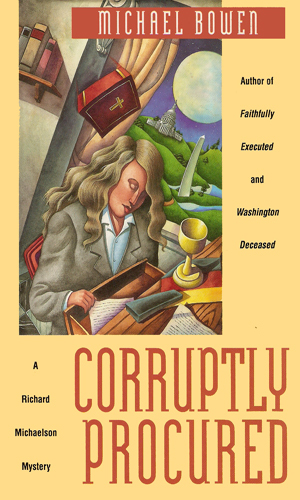 The Richard Michaelson adventures are all clearly mysteries based in and around Washington, D.C. and usually involve a body or two. They are also about intrigue and cloak-and-dagger activities and inter-agency rivalries and international crises. Each of these are dealt with by an exceptionally urbane, highly intelligent, very interesting man who has seen enough powerful people come and go to realize that no matter how important someone may be, they will eventually go away just like all the important people before them. A former Senator, a convict serving time and friend of Richard Michaelson, asks for his help as he is certain he will be killed while in prison. When the suspected hitman is found dead and all evidence points to the Senator, Michaelson suspects that they have just scratched the surface of the intrigue. The first federal execution in years is complicated by the fact that someone apparently killed the condemned man minutes before the lethal injection. Tied to a possible case of electronic voter fraud, the mystery is handed to Richard Michaelson by a White House staffer who is not out for the truth so much as the avoidance of embarrassment. Attending a reception at the Library of Congress, Michaelson is injured in an explosion which allowed a German nationalist group to steal a rare book, a theft which will come back to cause him even more interesting problems. As he looks into it, he is blocked by the CIA, the White House, and one very powerful law firm. 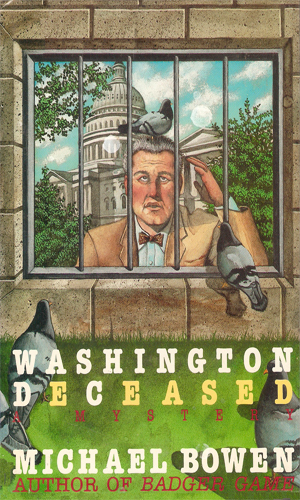 An aide to the Secretary of State is murdered while attending a conference and Richard Michaelson learns that there are a good number of people who want to see the case go unresolved. 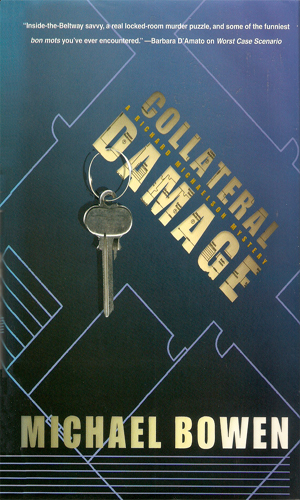 Michaelson is soon faced with the question of what is more dangerous for him - solving it or letting it go. Richard Michaelson is not the only one interested in buying the home of a now-deceased CIA bigwig; there are several others. When a body is found in a locked room in the house, the case takes on a very somber note. 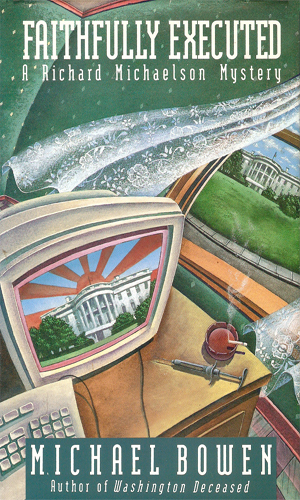 Now Michaelson is interested in more than real estate as a missing document might just destroy a Presidential hopeful. I knew long before I picked up the first book that this series was principally a mystery series and might well not belong in this compendium but the idea of a former operative, albeit for the State Department, getting involved in murders sounded like a lot of fun so I got the books. From the first couple of pages with the lead character, I knew I was going to greatly enjoy my time with Richard Michaelson and throughout the books, I never lost that feeling. There might be one or two more erudite characters in this collection of spy series but I would not want to live off the difference between them. Michaelson is an incredibly intelligent and observant man who is aided most admirably by a female of similar age to his who owns a bookshop and is Michaelson's equal when it comes to brain power. While Marjorie does not have his experience in the shadowy world, her understanding of politics and politicians, coupled with her intimate knowledge of the Washington social scene, more than makes up. Together, they make a terrific team. Michaelson is not perfect for he sometimes chases what turns out to be a red herring but he does not do it often or for long. He is incredibly slow to anger and the diplomatic skills that served him well during his first career keeps him going with many in Washington might otherwise cause a less controlled man to violence or drink. I was at first taken aback when the matter of Michaelson's ambitions were brought out but the calmness with which he admits his desires and the way that he does not let his own plans get in the way of the jobs he undertakes puts a lie to the idea that he is out just to further his portfolio. Yes, he would like something juicy in the way of a final position inside the government but he would not sell his soul or his ethics for it. The writing style that Mr. Bowen gives us makes these books immensely fun and keeps you reading. More than one time I have had to stop and look up a word or reread a passage to get the full significance of something said but it is always in the form of dialogue, usually spoken by Michaelson, and not in the prose itself. 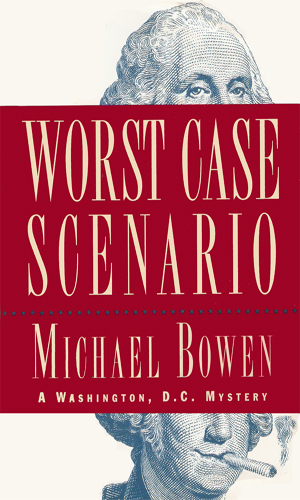 Mr. Bowen is an excellent storyteller who can easily set up a scene where Michaelson might spout out something deep and full of hidden meaning only to have the listener respond with a "huh?". This is done in such a way, though, that you know Michaelson is just darned intelligent, not pretentious. It is obvious that I liked this series a lot. If you liked locked-room mysteries in addition to intrigue and back-stabbing, you will like this series a lot as well.